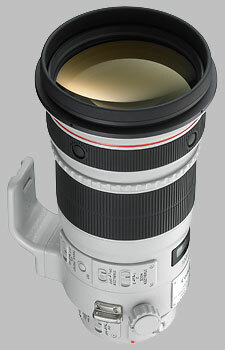 In August 2010, Canon announced the next iteration in its super telephoto primes; the 300mm and 400mm ƒ/2.8 II lenses. These optics appeal to nature, wildlife and sports photographers, and the new lenses feature updated technology with these users in mind. The 300mm ƒ/2.8 lens was designed to fit on the EF (35mm) frame, and is therefor compatible with all of Canon's recent film and digital bodies. On a camera equipped with an APS-C sensor, the lens will offer an equivalent field of view of 480mm. The lens accepts 52mm drop-in filters, and ships with the ET-120(WII) lens hood. The lens is available now for around $7,000. With the price tag of this lens, you would expect top-tier results - and pleasantly, there's no surprise here. On either the sub-frame Canon 7D or the full-frame Canon 1Ds mkIII, we noted excellent results for sharpness from ƒ/2.8 all the way to ƒ/8. At ƒ/11 diffraction limiting starts to set in, but even then there's no practical impact on sharpness until ƒ/16, where there is a very slight reduction in overall sharpness. Things are slightly soft at ƒ/22, and while the lens will stop down to ƒ/32, we note quite soft results at this aperture. Again, results for tolerance to chromatic aberration are excellent, with extremely low testing results. Looking at our sample images, I'm hard-pressed to see any form of color fringing in high-contrast areas. On the sub-frame 7D, there is no corner shading to speak of at all with the 300mm ƒ/2.8 II mounted; on the full-frame 1Ds mkIII, there is a slight amount of corner shading with the lens set to ƒ/2.8; in this case, the extreme corners are a half-stop darker than the center. Canon has clearly spent a lot of time on the design of this lens: on either a sub-frame or full-frame body, there is absolutely no distortion present in images shot with this lens. The 300mm ƒ/2.8 II focuses extremely fast, and also very quietly. As a USM lens, you can override focus results at any time by just turning the focus ring. The lens is also equipped with a focus preset system, which allows the lens to ''memorize'' a given focus distance, and return to that focus distance when the dedicated present ring is tapped. The lens also is equipped with a focus limiter switch, enabling the focus performance to be improved by limiting the range of distance being focused upon. Focus limiting options are 2m to 6m, 6m to infinity, and 2m to infinity (this represents an improvement of half a meter for the close-focusing distance over the previous version of the lens). If that's not enough, the new lens now includes a PF ''power focus'') mode, which is designed for use with video shooting. The mode is designed for constant speed focus pulling, and there are two speeds available in this mode. Out of the box, the 300mm ƒ/2.8 isn't very useful for macro style shooting, offering just 0.18x magnification and a minimum focusing distance of 2 meters (around six feet). However, with extension tubes the lens could be used reasonably well in this capacity. Rather than just cut and paste from the previous review of the Canon 300mm ƒ/2.8 IS USM, I will focus on the changes made in the new version II lens, as the new version incorporates all of the design features of the old lens, and adds some new things, too. But first, the obligatory gush about Canon's build quality on its L-glass lenses; it's as good as it gets, and for the price you've paid, you should expect nothing less. The 300mm is dust- and weather-resistant, built with great attention to detail. The lens ships in a hard case with a protective interior. There's no front cap for this lens - rather, there is a leather-like lens hood to protect the whole front half of the lens. Canon has redesigned the lens, with a practical implication that it's a bit smaller (okay, not a huge amount - 4mm shorter) and weighs a bit less: 5.3 pounds, instead of 5.6 pounds. One of the changes that accomplishes this weight savings is the removal of one lens element: while the old formula was 17 elements in 13 groups, including 1 flourite and 2 UD elements, the new lens uses 16 elements in 12 groups, including 2 fluorite elements. The new lens uses nine rounded blades to form the aperture, instead of eight standard blades, so we should be seeing some nicer results for out of focus elements. Sticking to the exterior of the lens, it offers a recessed and windowed distance scale marked in feet and inches, but unlike the previous version of the lens, there is no depth-of-field scale (nor is there an infrared index, but there wasn't one on the previous version, either). Canon's made an important design change that I think is worth highlighting: they've separated some of the operation switches into a second group and moved it into a new location, closer to the mount of the lens. Specifically, the focus mode selection (AF / MF / PF) and the focus limiter selection have been moved, leaving the focus preset, and image stabilization selection switches in the previous location. I think this change alone will make the lens much easier to get up to speed with, as the user will not have to check the side of the lens as often to make a quick change. Canon's added a new mode in its image stabilization control: mode 3, which is designed for shooting ''irregularly moving subjects.'' The practical implication for this mode is that the image stabilization system is only active during the time the exposure is made. Normally when using image stabilization there is a very brief moment where the system starts up; in theory, using mode 3 would mean that the user won't even see the effect in use, because of mirror blackout. We'll be doing some testing specifically on image stabilization in the near future, including this new mode. The focus ring has been redesigned as well - it's a bit larger (1 3/4'' inches wide instead of the original 1 1/4'') but still uses the easy-to-grip raised rubber ribs. The turning radius is the same (around 180 degrees) and still ends in soft stops on the close-focus and infinity ends. The will focus past infinity. As a USM lens, you can override autofocus results by turning the lens at anytime. The lens uses 52mm drop-in filters, so front element rotation isn't an issue (nor would you want to use front-mounted filters - it's a huge element) and a glass filter that can accept gels is included: others, including a polarizing filter, are available separately. The tripod ring has also been redesigned. It's no longer removable, but now features click-stops at ninety degree positions. As well, the lens has a security slot under a flap on the tripod locking knob to allow you to use a wire type lock (laptop style) to secure the lens to something immovable. Canon EF 300mm ƒ/2.8L IS USM ~$? The former version of the 300mm ƒ/2.8 has now been discontinued, so the only place you're likely to find one is the used market. Make sure you're getting a good deal on one of these if you can't afford the version II, as the new version of the lens features improvements in every category: it's sharper, less susceptible to chromatic aberration, corner shading, and has absolutely no distortion. That said, the old 300mm ƒ/2.8 was no slouch, and we loved it just as much when we reviewed it, too. At less than half the price of the Canon, the Sigma 300mm ƒ/2.8 presents a very attractive option for shooters on a budget. However, there is an indication of what the extra price gets you: the Canon is better than the Sigma in almost every category except distortion, where the Sigma matches it. Where the lens really falls short is in the control options, where the Canon lens offers focus presets, image stabilization, and focus limiters. Tamron 300mm ƒ/2.8 LD IF SP AF ~$? Tamron and Tokina used to produce a 300mm ƒ/2.8 as well, but it's been discontinued by both manufacturers. Where the original Canon 300mm ƒ/2.8 IS USM was very good, Canon's refinements have made it even better. If you're looking to buy, it doesn't get any better than this, but then, you probably already guessed that. I rented this lens for a week and tried it out at every opportunity. The iq is simply awesome. I found the lens to be uncomfortable to handhold. I would have removed the tripod mount were it possible to do so, but I could not find a way. The focus ring is so large that I always had my hand on it, which is good for MF but not so for AF. I am so used to the flexibilty of my 100~400 that I much prefer it to the 300. I compared IQ of both lenses and find that, for my purposes, the 100~400 is my best option. I used the 300 with a 1.4 extender and was not happy with the results, but without the extender it was slightly sharper and clearer than my 100~400. I will continue to wait for Canon to update the 100~400 and hope that the new one will be as sharp as my old one. The attention to detail in the build quality is stunning. First, the lens just feels great in the hand. Focus ring moves smoothly with no play. Switches have a nice snap to them and positioned well enough that you won’t be bumping them into the wrong position (something I do often with my 70-200 II and have to use gaffers tape to cover them!). The tripod ring with the 90-degree indents are a really nice touch. The buttons have a high quality feel to them. The lens was also well lubricated (as you can hear the lubricant when you move the focus ring and the power-focus ring slightly). This lens is for sure a step above the high end L’s in the sub-$3,000 range in terms of build quality. The colors and contrast are fantastic straight out of camera. The isolation given from the 300mm and f/2.8 is really quite awesome, even at great distances. The 3-D “pop” is also present with this lens, thanks to the isolation ability and extremely high resolution and contrast. The minimum focus distance is really nice, I am glad Canon was able to improve it over the Mark I. I did not run into many instances where I had to backup to get the lens to focus. I am simply fascinated by the mode-3 IS… I was confused on how this worked, as I never really read a clear description of it. To clarify for others, when you start to meter (say half-pressing the shutter or back button focusing) you hear the IS kick on as you would expect. However, the viewfinder does not stabilize. It appears like the IS is completely off. 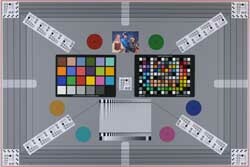 But when you go to take the image it instantaneously kicks on and stabilizes the image perfectly with no visual delay. I could not get over this! A really cool feature. Overall, the IS works extremely well and is actually really quiet (even more so than the 70-200 II). You hear a confident “chirp” when it turns on/off, but nothing during operation (unless you lay your ear on the lens). Big improvement over the Mark I when I rented it. The IS also behaves extremely well on a tripod to help combat faint vibrations when using telephotos on a tripod. No reason to turn off IS on this lens, as it actually benefits with tripod use! I think unless you are doing exposures over 1-second, the manual recommends to leave it on. The AF performance of this lens appears to be extremely good. Shot-to-shot sharpness is very consistent and I have yet to get an image that was randomly out-of-focus for reasons other than my own. My lens did require microadjustment on my body, around +9 for the lens alone and +12 with the 1.4x III. As a reference, every single lens I own requires positive MA values… My 16-35 II is at +6/+7, 24-70 II at -1/+4, 35L at +6, etc… So it is not that abnormal compared. The weight is surprising with this lens… I rented the original IS and it was a hefty lens (as is this one), however the Mark II appears to be better balanced and not as front-heavy making it feel lighter than it is. I have no problem what-so-ever handholding this lens for long periods of time. For reference, this lens along with my 5D3+Grip comes in at 8lbs and 15oz. I don’t plan to use the tripod much at all with this lens, there really is no reason to if you are able to support the weight… A good camera strap (I recommend Op/Tech) are extremely comfortable for supporting heavy loads. The case included with the lens (along with keys) are nice additions. I will use mine often when transporting and storing the lens. The new lens cap is a HUGE improvement over the old version, far less clumsy and easy as can be to use. Canon did great updating this. The only downfall of this lens would be the price… While it is the cheapest of the Mark II super-telephotos, it is still a very expensive lens. However, as expensive as it is (even as a hobbyist only) I don’t feel cheated. The performance and build quality of the lens help curb the sting a bit. I highly recommend this lens to those who can afford to splurge on it. You won’t be disappointed. What can be written about the latest incarnation of the 300 f/22.8 that haven't been done elsewhere? I bought one of the 1st lenses in Germany (reason for the high price tag) and use it ever since almost purely was a walk around lens. Either in Venice or for wildlife on my FF camera. 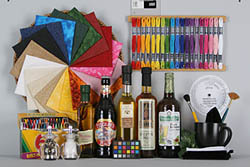 The image quality easily outperforms all Canon zooms and that tells a lot. Additionally it is the most affordable and lightest of the new type II teles and with the 1.4 and 2.0 type III extenders it just shines. Focussing is no problem on my 5D II (opposite to many whiners about the AF system). Micro contrast and color reproduction are simply the best I've seen so far from any lens I've owned. Canon does incredible lenses - the sole reason currently (end of 2012) to stay with Canon. I conducted a test of the Nikon D800E with the 70-200 f/2.8 VR plus 2x converter vs my 5D II with the 300 f/2.8 II plus the 2x extender in a stage performance. The printed results (24x36 inches) of the 5D II easily outperformed the results of the Nikon gear. I was about to purchase the Nikon tool chain but the 300 II is so good that every further thought was unnecessary. I hope that Canon brings out a 7D II with > 20 MPixel and > 10 fps - the 300 II will be the wildlife and action king. On FF it offers a very unique bokeh quality and last but not least it simply delivers - all the time if you know how to handle it properly. The lens to buy if you are intending to travel a lot. I own the fantastic 70-200 f/4.0 L IS USM but in direct comparison the zoom feels like a toy and the quality of the bokeh is a completely different story. Price - but the best is worth it. I take bird photos with a Canon 7D and either a 100-400mm or a 400mm L f/5.6 lens, hand held, with nice results. But, I wanted something hand holdable that would enable me to keep up with the pros and their longer lenses and tripods. I decided on the 300mm II because it is only 2350 g (less than a lb more than the 400mm f/4 DO) and was reputed to give excellent results with the 2X TC. The results have turned out to be spectacular: the sharpness, contrast and colour are simply unbelievably good, and are hardly lowered by the 2x TC III. Most importantly, the reproducibility of focus is outstanding, which is necessary when you crop 2% of the image and want to see the feathers. Once you have used this lens, it is difficult to go back to the others. And, it is not too heavy for an old guy to carry around all day. I have the original IS version of this lens as well as another current version from another manufacturer. If you are serious about the best just buy it. Words cannot describe this lens. It is simply indescribable. You have no idea until you use this lens. Actually the review here is much to modest in my opinion. Udate: I have had this lens for over two years now. I use it now more than ever. It has it's place in birding for sure. I use it as a walk around lens and low light lens. I am more in love with it today than the day i bought it. Use it mostly with extenders. And it performs beautifully. This lens to me represents the current paragon for optics from any company, i'm also willing to say perhaps of all time! I mention these not for any other reason than to hopefully give weight to my review; so that when i say this lens surpasses (by a considerable margin) any of these lenses you may be more inclined to believe me. What is so remarkable about this lens, at least to me, is the wide open performance. This is the only time ive ever said this about an optic, but there is ZERO difference in sharpness compared to 2.8 vs 5.6! I have simply never seen such parity. Thats looking unsharpened raw in DPP @ 200%!!! Paired with a 2x TC III the results wide open are still in the fu** me catergory!!!!! To be honest words are mostly pointless for this review, if you want what i truly believe to possibly be the finest optic on the planet then you will not be upset with this incredible offering. The price is outrageous, but to be brutally blunt so is the lens quality. I loved my MK1 but this beast is just on another level, TBH its on another level with absolutely every other lens (best canon L at least) out there. Im gonna go now because i actually can't praise it highly enough. First i had a Sigma 50-500 using with Sony a mounth. now i use canon D7 with this fantastic verry fast lens together with the X 2 extender .The difference is large. This is my best Canon lens.